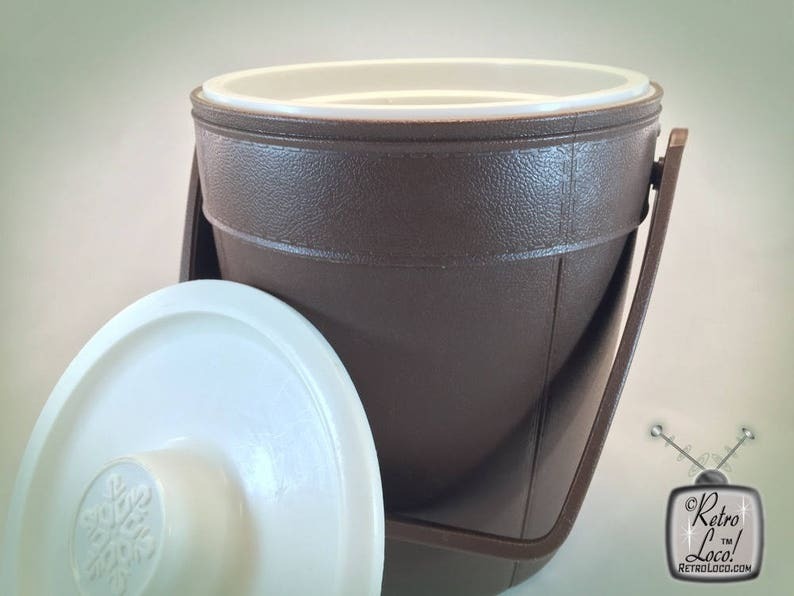 Vintage 70's brown & white plastic Rubbermaid ice bucket. Great for retro kitchen, man cave, poolside, patio, picnic or tail gaiting. The bucket has faux stitching on it; it reminds me of the stitches on a football. A funky find from the groovy seventies! It has a completely removable lid. Lid has a raised snowflake design imprinted in the center. NOT dishwasher safe! Do NOT put in dishwasher. Hand wash only! I do not recommend immersing it in water, either. Vintage insulated items such as this tend to not be water tight, and water might seep in between the layers of plastic. ❉ What you will receive: One ice bucket with lid. ❉ Color: Dark brown ice bucket with a white lid.